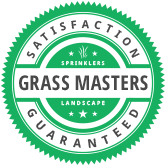 You might ask yourself why should I choose to hire Grass Masters over someone else? That’s a great question but we’ll try and back ourselves up! We have over 550 clients and have continually grown each year. We know this is only possible by treating clients well and providing exceptional service year after year. In fact each and every month we receive notes from our clients thanking us for what we do for them. We have a 4.8 out of 5 Star Ranking on Google. Don’t just take our word for it look at what others have to say about us. We are a fiscally strong and conservative company working towards becoming debt free within the next year and a half. You might ask why that matters? It’s because we will still be around long-term to care for your lawn when others are unable to weather the storms of turbulent times. We are built to last! We use state of the art software to keep track of all of your scheduled services and requests to make sure we don’t leave what you want completed unattended. We work to schedule our services so that we care for your property the same day each and every week so you know when to count on us. We maintain our equipment to keep it running top notch in order to care for your lawn. We also sharpen our blades every week to keep your grass looking as good as possible. At the end of the day we don’t just care about your lawn, we care about YOU!